Fifteen years after providing the complete audio-visual system for the Our Dynamic Earth attraction, Electrosonic returned to help the science center bring “Scotland’s Time Lords” to life. Electrosonic was charged with the design and systems integration of the AV elements, under subcontract to Studio MB, engineering the new exhibition with reliable components within a simple system architecture. “Scotland’s Time Lords” introduces visitors to the Scottish scientists who laid the foundation for the modern paradigm of plate tectonics. Three new interlinked galleries take visitors from an 18th century themed classroom with magic blackboards and talking portraits back through Deep Time to the Big Bang and beyond. Visitors learn the impact of James Hutton and Arthur Holmes on the evolution of earth science, and celebrate the fact that scientific discovery is at the heart of Scottish culture. The journey begins when the visitor passes through oak paneled doors and steps into a 19th century styled lecture room. Eminent geologist and ‘first Time Lord’ James Hutton demonstrates his theories on how the Earth was formed while large blackboards with animated imagery and text stand on either side. Hutton appears to be in the room through an application of the Pepper’s Ghost technique; his image is actually presented on a horizontally-mounted 63-inch Samsung LCD screen. He’s flanked by blackboard-style projection screens, fed by Optoma projectors, illustrating his talk. Portraits of later geologists, all with Scottish ties, are actually 55-inch Samsung LCDs, which come to life to comment on the importance of Hutton’s insights. The second section looks at the contributions of Arthur Holmes, a professor of geology at Edinburgh University in 1942, whose studies led to the concept of plate tectonics. Visitors view a suspended globe presenting animations explaining plate tectonics and their relevance to earthquake and volcano zones. 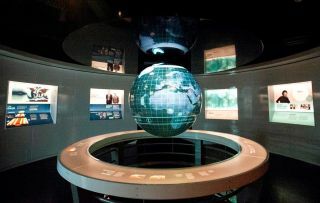 The globe is a Puffersphere, which uses a ceiling-mounted projection design F32 video projector with a custom lens to project onto the internal surface of the sphere; a computer plays out source images and provides the geometric corrections required to deliver distortion-free images on the globe’s surface. The Deep Time Machine comprises the third and final portion of the new exhibits. Styled as a large elevator operated by an AMX controller, the gallery transports visitors back in time to the Big Bang, showcasing giant images on 55-inch Samsung LCDs. In a collaboration between Our Dynamic Earth and ISO, new footage offers visitors the chance to witness the development of the universe and the early days of Earth. When the “elevator doors” open at the conclusion of the journey, visitors exit to the science center’s existing spaceship-themed “How It All Started” show which features a new film produced by National Space Centre Creative (NSC Creative). Audio equipment for the “Scotland’s Time Lords” exhibit includes Tannoy loudspeakers, Cloud and RSF amps and AMX Precis signal processing. Most source and control equipment is housed in the existing AV racks in the central control room. HD players for the Time Machine are adjacent to the displays they serve.